In this tutorial, I show you how to create my Combination Journal & Scrapbook Mini Album. This is a brand new style of journal I designed for those who like to write in a diary AND store photos and special mementos all in the same book. The journal album measures 9"h x 6-1/2"w and is 4" thick. It contains SIX individiual 15-page journals for a total of 90 pages! The album is very interactive. There is a total of 12 pages not including the inside covers: 6 base pages that hold the journals on the front, and photo pages on the back include mini album elements such as flaps, pockets and even a waterfall. 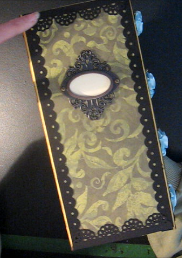 The side of each of the 6 base pages includes a large pull-out tag where you can attach photos or journal some more. In the tutorial I show you how to create the entire album from scratch including the covers, the binding, the pages, how to attach the pages into the album, how to make the hitch post and chain closure - no need to buy a hitch post when you can easily make your own! I also show how I embellished my album. As always, the emphasis is on using the supplies you already have on hand. I made the journal album pictured above using the "Meadow" paper stack by Susan Winget (K&Company) - you can also see it in detail in the 1st video below. I also made one using the "Merryweather" stack (K&Company) as seen in the 2nd video. Customize your journal album with the papers and embellishments you already have on hand. The tutorial is in PDF format and contains 75 pages of extremely detailed step-by-step instructions with about 350 photos that show how I created the journal album from start to finish. Measurements are included for each piece you will need to construct the album. In addition to the written tutorial, I'm including free links to my series of unlisted ONLINE VIDEOS that show how to make the journal album as I create a brand new one from start to finish. I plan on making these videos available to everyone who purchases my tutorial for as long as the service provider can continue hosting them for free. 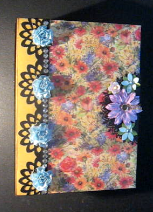 Below are a few more photos of the combination journal scrapbook album I make in this tutorial. By purchasing this tutorial, you can make as many journal albums as you wish for personal use. You can also make and sell the journal albums you make. If selling journal albums online, please credit me by including a link to my website: “Tutorial for making this journal album is available from www.scrappinrabbit.com”. If you would like to teach classes on how to make this journal album, a “Classroom Licence” is available for $29.99. You can teach as many classes as you wish. Note: Students each need to purchase a tutorial. Student tutorials can be purchased at a special price if ordered and paid for by the purchaser of the Classroom Licence. Contact me at scrappinrabbit@gmail.com if interested.